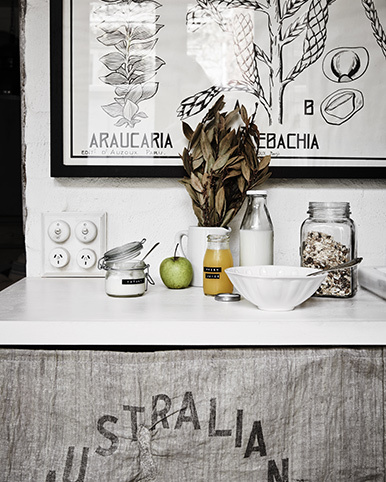 The Apartment St Kilda is a boutique rental apartment located in Melbourne's St Kilda, offering an inviting, eclectic and cleanly-designed aesthetic. It has been designed by noted interior decorator/stylist and shop-owner Lynda Gardener. Lucky for us, Lynda is back to share her secrets to selecting the perfect white and why it’s her all-time favourite base for any space. Hi Lynda, what are your personal tips when it comes to choosing white paint for an interior? White is never an easy choice, there are so many options. As a generaI rule, I stick to some basic rules. Firstly ask yourself - do you want a bright, contemporary white or a dirty white for the space? The style of your interior will dictate your decision. Generally, a very bright room in a modern interior will call for a fresh and pure white whereas an older home will sit well with a warmer white shade. Once you decide which one works for your needs, it’s pretty easy. For me it’s either one or the other. 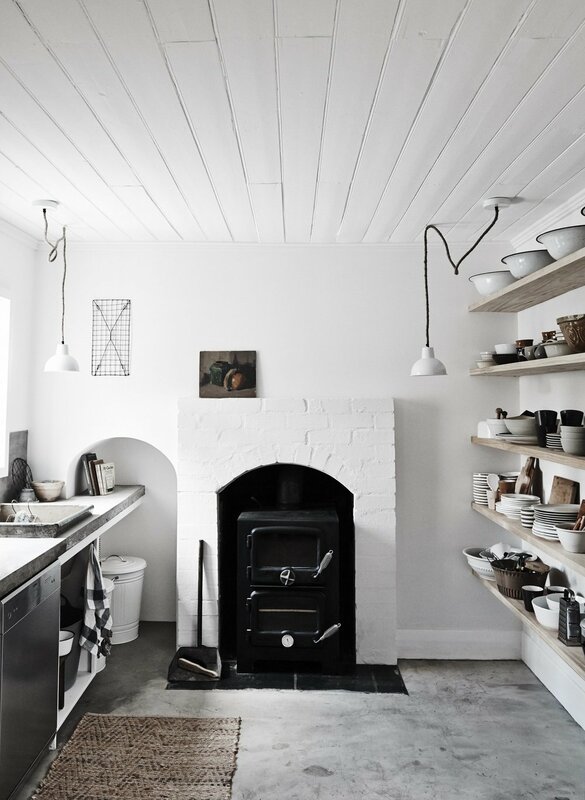 The raw white kitchen at Lynda Gardener's The Estate Trentham. Photo - Lisa Cohen. Tell me about your two new white colours in collaboration with Bauwerk? I have kept it really simple for the first collection - there are just two whites which have recently been released. Bleached - a bright luscious white lime wash paint and Raw - a dirtier off-white which has a warm, dirty tone to it. A bright and clean white corner in The White Room. Photo Lisa Cohen. What inspired you to bring out a white paint collection? I decided to start a white range, due to it appearing in every single house I have styled, renovated or lived in. It is always my absolute favourite base for a space. I really wanted to simplify the difficultly of finding the right white paint and I feel I have done this by having just two whites to choose from - for me this was key. Lynda Gardener's The Barn at The Estate Trentham in Daylesford. Photo - Lisa Cohen. Lynda Gardener's The White House in Daylesford. What does colour mean to you? Colour for me is always exciting, it’s what makes all our own homes unique. A favourite colour tells a story about the homeowner and what makes them happy. What can the right shade of white do for a space? The confidence in the picking of the right white for your space will make certain it’s not cold - the tone of white must be right for the space. My home in Melbourne has the warmer white in Raw, as it's such a large open space, I wanted it to feel warm and cosy rather than a contemporary gallery white. On the other hand it can’t be too creamy - when we move into more creamy whites, they can look dated. A little snapshot of the bathroom in Lynda Gardener's The White House. In an all-white room, what is the best way to introduce colour for someone who is a little colour shy? Try it in the art work. You may not want bright cushions or furniture but be bold and brave with art work - remember it can always be moved around into different rooms throughout the year for change and the white base will always be there. You can always add to your white room, use lots of green foliage and plants for a green statement, or bold colours through works of art. Lynda Gardener's white paint range with Bauwerk includes two beautiful whites - Bleached and Raw. Photo - Lynda Gardener. Are there more colours due to be released through Bauwerk? Oh that is a surprise! 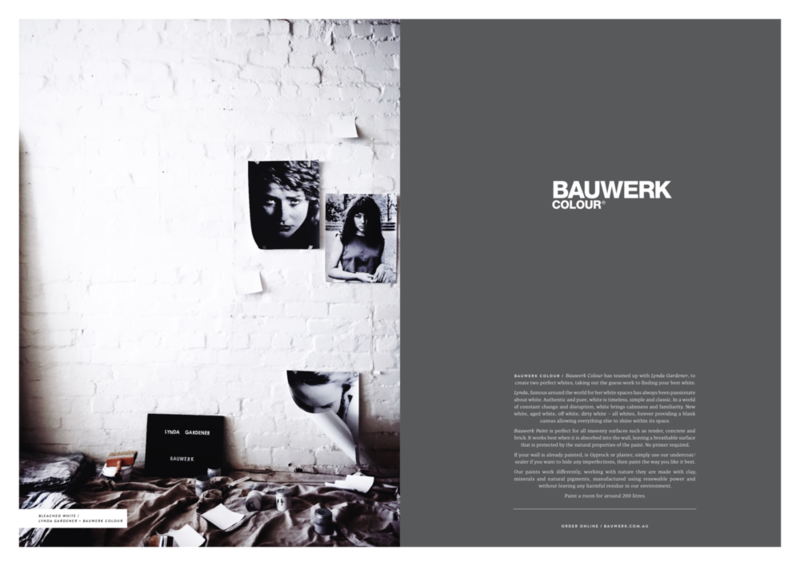 I will be working with Bauwerk throughout the year to bring out my next collection of colours which will be based on a new build I am working on in the country later this year. I haven’t yet set a launch date, as I want to work the colours in with the building as it progresses in real time. 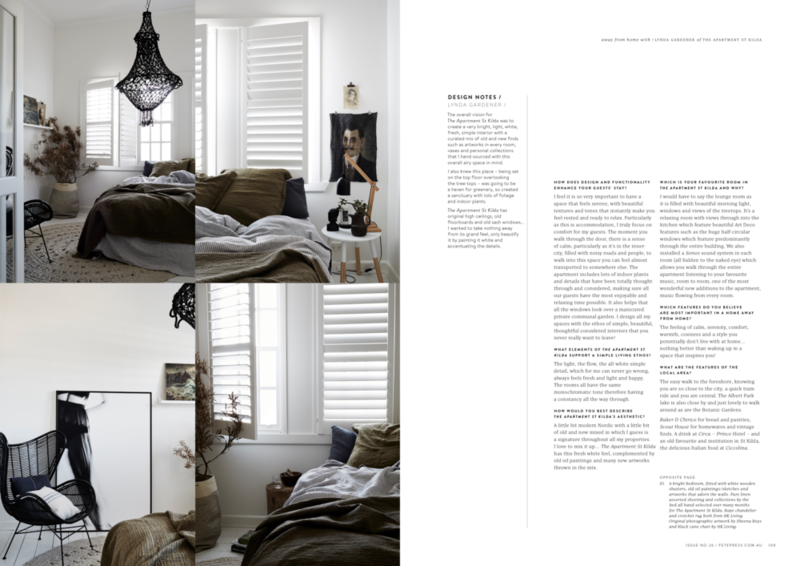 This range will be totally the opposite of white - they will be strong bold colours… earthy is my hint to you! We can't wait to see what you come up with Lynda - watch this space later in the year for more of Lynda’s collaboration with Bauwerk. Some people just have a gift for creating beautiful spaces, and one of those people is Melbourne based designer, decorator and creative entrepreneur Lynda Gardener. ‘The Apartment’, completed last year, is Lynda’s latest project – a lovingly decorated one bedroom rental apartment in a grand old 1920s building in St Kilda. This serene space, which Lynda originally purchased more than 16 years ago, channels a distinctly European feel. aving been in the design and styling industry for 35 years now (hard to believe I know!) Lynda Gardener has built a reputation as a supremely talented designer, stylist and creative businesswoman, with a very distinct aesthetic. Though she is ridiculously modest and down to earth, Lynda’s projects and properties are well known, having featured consistently in the media over the past 30 years, both locally and internationally. We featured Lynda’s Fitzroy home a couple of years ago, but today we’re thrilled to document her latest project – ‘The Apartment’. This serene one bedroom apartment in St Kilda channels a distinctly European feel. The apartment was, in fact, purchased by Lynda more than 16 years ago, and because she is one seriously savvy businesswoman (a more than a little nostalgic!) she has held onto it all this time. Part of a charming old 1920s building, miraculously, Lynda’s apartment has needed very little renovation work over the years. ‘Thankfully, the apartment was in perfect original condition, so all my changes have been cosmetic’ Lynda outlines. These have included painting all floors, walls and ceilings in various shades of white (the original walls were all terracotta and the floorboards black). Shutters were installed on the windows, and new cabinetry doors added to the old kitchen cupboards. Amazingly, the overall layout, sweet tiled flooring and aged walls in the kitchen are all original. ‘It was quite an easy renovation, when the bones are this good…!’ Lynda enthuses! It was the architecture and style of the building that first attracted Lynda to the property. ‘It totally commands attention as soon as you drive up the street, it’s very striking with wonderful old circular staircases, and it is from a very beautiful era of apartment architecture which I have always adored’ the designer says. ‘The apartment itself is so spacious, with lots of room, which sadly you don’t come across more these days’. Indeed, one visit quickly makes you realise that they really don’t design apartments like they used to. Of course, Lynda’s intuitive knack for styling has also been a big part of the transformation of this space. Her exquisite collections of old and new artworks, furnishings, cushions, layers of rugs, and beautiful linen lift this sweet abode to the next level. 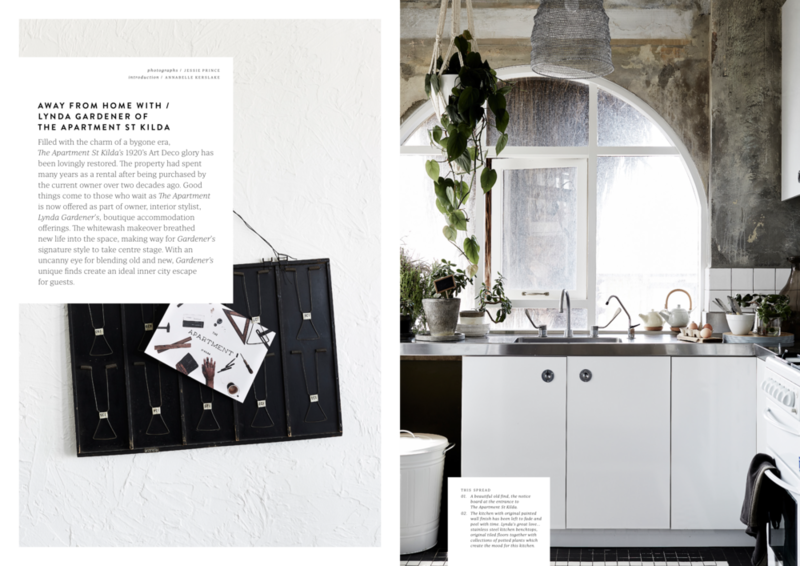 ‘I’m always inspired by Dutch and Nordic spaces that feel fresh, simple, open and not too cluttered’ Lynda muses. ‘I think this apartment was really influenced by my many travels to Amsterdam, and their great aesthetic’. Having previously leased the home to lovely tenants for many years, Lynda has enjoyed having the opportunity to reclaim and re-energise the home, and transform it in her signature style. It is now part of her stable of boutique accommodation properties – along with The White House in Daylesford, The Estate Trentham, The White Room in Fitzroy. Each of these properties is available for accommodation, events and photoshoots. Find The Apartment on AirBnB here. 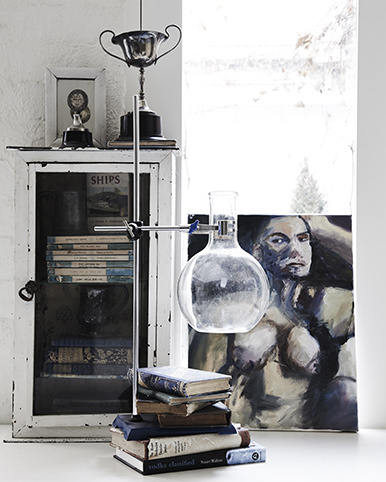 I’ve been lucky enough to experience Lynda Gardener’s beautifully styled interiors. I walk away each time gobsmacked by her intuitive knack for creating such magical spaces. Lynda’s distinct style features a soft palette with layers of rustic and modern elements in equal measure. Based in Melbourne, Lynda started her design career at the age of 19, fast-forward to today and there’s no stopping her inspiring drive and ambition - she is forever dreaming up the next beautiful project! Lynda runs 4 boutique accomodation properties in Melbourne and has just released a line of paint colours with bespoke paint company Bauwerk. You now have 4 boutique accommodation destinations in Victoria, what inspired you to bring your designer’s eye to these properties and how do they differ? 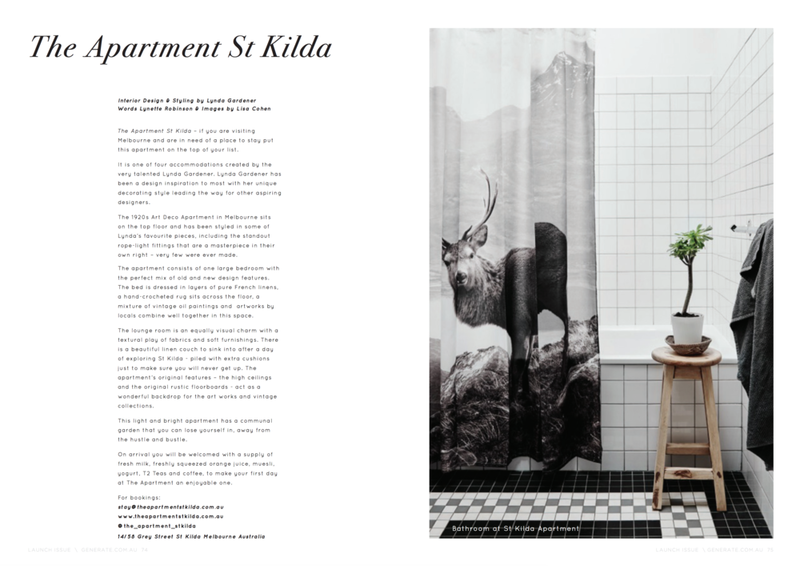 On a recent visit to Melbourne, head of styling Jessica Bellef spent a few days in the beautiful world of interior designer Lynda Gardener, at her latest boutique accommodation offering, The Apartment St Kilda. Here they caught up to talk about Lynda’s inspiration, her favourite local haunts and her tips for bed styling perfection. Have you ever had that surreal feeling of visiting a place you have seen many times through a TV screen or pored over on the pages of a magazine? That out-of-body, “I can’t believe I am seeing it with my own eyes” feeling? That’s what happened when I walked into The Apartment St Kilda on my last trip to Melbourne. As a fan of Lynda Gardener’s interior styling work for many years, it was such a visual treat to spend some time in one of her beautifully curated spaces. The cherry on top was the chance to speak with Lynda about her spaces and her approach to styling. We love the perfectly balanced mix of vintage and new decor and furniture in The Apartment. 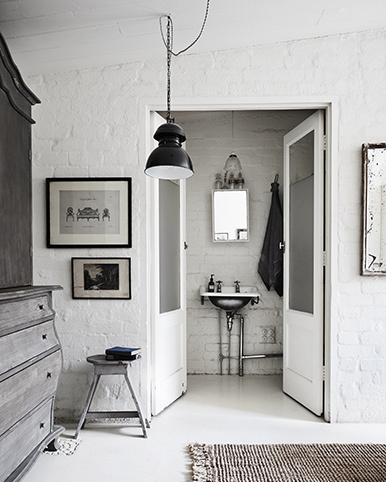 What’s your top tip for people who struggle with mixing eras successfully in their home? What are your 5 favourite design destinations (shops, restaurants, bars, markets and galleries) to visit in the St Kilda area (or more broadly in Melbourne)?Locally in St Kilda, Scout House for homewares and furniture both old and new. A great guy called Orlando, who has a knack for sourcing great finds, runs it. Ciccolina is an old-time St Kilda favourite. I can’t wait for the new Stokehouse to open in a few months. I am sure it will be outstanding in every way! And of course I have to add my own store Curated – Lynda Gardener in Albert Park, just around the corner. I have been in that gorgeous store for 23 years now. Once a week I usually stroll around Melbourne’s laneways, always mesmerised by some of the beautiful old buildings and architecture. I still find buildings I haven’t really noticed before. The city has become such a cool place to visit, with new bars, cafes and restaurants that are literally opening every month. An old favourite for me is The City Wine Shop in Spring Street. It’s one of those places that will never ever date. I always feel as if I could be anywhere in the world. To me, it’s an iconic place to eat, chat, meet friends and make new ones. Lastly, Pellegrinis is such a classic – it has stood the test of time whilst the city has changed all around it. It’s a time warp! 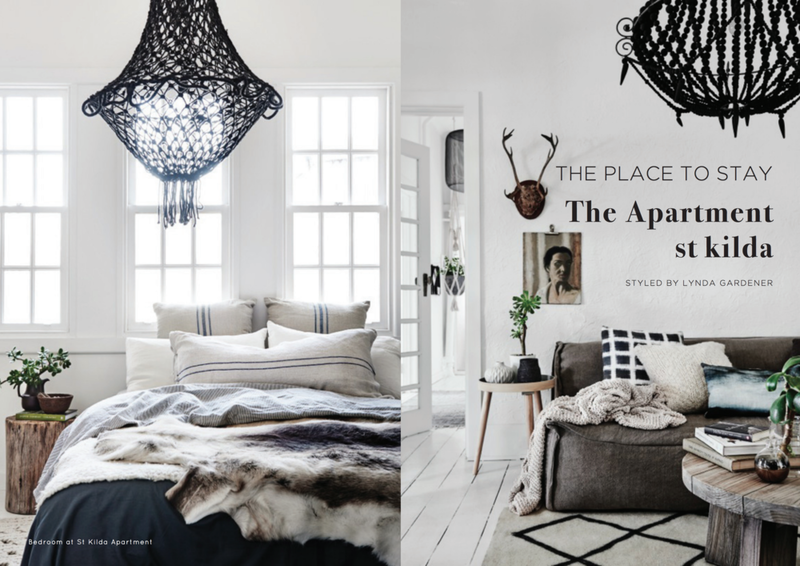 You are a retailer, boutique accommodation operator and a busy interior designer and stylist. How do you find the time to sleep at night and what’s on the horizon for you? I love what I do and there is never a day that I am not excited to get up and work on my daily list of things to cover. I am a light sleeper and unfortunately do a lot of my deep thinking during that time. On the positive side, lots of my bright ideas come out of these quiet nights, trying to sleep. I guess my brain really does not switch off! I have quite a few ideas up my sleeve and one will actually be opening new accommodation (yes, I know!) in 2017. Spotlight on melbourne | lynda gardener. when did you move here? and why? 18 years ago - always loved this side of the city and never want to move! describe yourself in 3 words or less: passionate, warm, unique. describe melbourne in 3 words or less: just gets better or laneways, cool, graffiti. what do you do here? interior stylist/decorator/hotelier with four accommodation properties (soon to be five) and occasional housekeeper! what does a normal day look like for you? wake up early (usually 4.30am and start thinking) try to fall back to sleep and wake up 7.30ish-am…work on emails/bookings for a couple of hours, walk jack (my dog)…head off to style/work on interior projects/source/attend to the country properties/more emails/client meetings/phone calls/more emails/bath/ curl up on the couch around 8.30pm with my boyfriend and relax by watching a tv series, usually to take me to another place for a while! off to sleep around 11pm. go-to coffee spot? i have never drank coffee…(can you believe it!) however i have always loved the concept and style of market lane coffee - all their locations in melbourne are simple, cool and styled perfectly. favourite melbourne brekkie? it changes by the week, we are so lucky to have one on every corner and practically a new one moving in somewhere every month! i can’t keep up. they are all great! current new favourites are oxford larder, collingwood; higher ground, cbd; and old favourite: babka, fitzroy. and favorite date-night dinner spot? marion: gertrude street fitzroy; or the city wine shop (which has been my favourite for over 20 years), in the heart of melbourne. where do you like to shop? i love any flea market i can get myself to!! whereever i am in the world, i will find one! i have always loved melbourne’s camberwell market and any small design markets held in melbourne throughout the year. favourite design store? third drawer down; tarlo and graeme for vintage; and scout house for a beautiful mix of old and new. favorite local fashion label? not sure i have a favourite…so its not a fashion label however, i love aesop for their beautifully designed stores and fit outs all around the world…they made their start in melbourne and always feel so inspired by their store designs….i seriously drool over every interior! where do you take friends who are visiting from out of town? oh i have lists of places…..breakfast at higher ground, designed and set up in an ex-power station in melbourne’s cbd….a walk through the historic laneways in the city as they are filled with local labels, independent boutiques, super cool cafes, hole-in-the-wall coffee shops!!! always collingwood, smith street and gertrude street as they are a must. when the sun comes out in melbourne, where do you like to hang out? my local park…the edinburgh gardens in nth fitzroy…one of my favourite things to do - a picnic in the park with my boyfriend and dog by my side, just lay in the sun and people/dog watch! where do you go to get inspired? every day something new inspires me…from creative friends doing their own thing and starting new individual businesses to the architecture in our old city buildings…every day i find inspiration in something new. favourite gallery? i always love a local random gallery! right now there is one being held in an old disused cinema in fitzroy! any other secrets we should know about melbourne?…just to the city/laneways/fitzroy/collingwood/brunswick as seriously i can’t even keep up with it all…every day there is a new find, a new opening, a new cafe, pop up, food truck…its the best! where is your next holiday? copenhagen is current on the list, must do right now and a quick visit to amsterdam, just one of my all time favourite places to be! what 5 things do you always pack? my jewellery - chunky rings and necklaces that dress up anything i am wearing….my favourite perfume, favourite shoes, phone and camera as i am forever taking snaps of everything!! what are some of the quirky things you always do when traveling? buy a local baguette, or pastry and find a park to sit and take it all in - spend an afternoon just sitting! whats on your stereo? oh my tastes change all the time, so it could be chet faker, flume, nick cave and then crosses over to some old time favourites such as cesaria evora and compay segundo. who is inspiring you right now? always a wide variety of beautiful people - from iris apfel for doing her thing at the age of 95! to director wes anderson for the incredible movies he creates (all the time) - people in my industry, hans blomquist and glen proebstel for their totally individual styling and art direction - stylists, creatives, bespoke retail stores just doing what they love most - happily, confidently and passionately. words you live by…over planning kills the magic! I first remember spying Lynda Gardner when I was six month pregnant, standing on my stall at Camberwell Market, hocking off a framed pair of illustrated Balinese dancers that my Nan wanted to re-home. With her serious hive of black waves piled high and adorned with a silk flower, there was no mistaking Lynda in a crowd of beige cardigans. And that’s how I’d describe her. Unmistakable. Whatever Lynda touches, her mark is very distinctly her own. She pulls together seemingly disparate and discarded objects and bring them to life in a new way. Her first leap 23 years ago was to open a small, curated, style vintage store called Empire Vintage, which was well ahead of her time. Since then she has evolved, relaunching the store earlier this month, now called Lynda Gardner : Curated. Embracing the things that set her heart on fire, and being true to her own aesthetic has taken Lynda has leaped from visual merchandiser for Levi’s to store owner, to stylist, to boutique accommodation provider with four beautiful and unique properties. Lynda is guided by asking herself the questions ‘What would I love to do?’, ‘What experiences do I want?’, ‘What would I want to feel being in this space?’ Digging into her own desires and beliefs has meant that she has created destinations layered with story and visual feasting. So sweet kin, what would you love to do? What are you curious about? How can you explore those ideas? What does your personal signature look like? What would you need to do to make the leap possible? From an extremely early age I was always interested in markets, gathering, collecting and curating beautiful things. One of my first big vintage purchases was from a market – a beautiful vintage chest of drawers and I was so proud to drag it home and decorate it in my room. At that time I was also interested in collecting beautiful vintage clothing from the 20s and 30s – my obsession grew from there! Around that time ideas started to form about what I wanted to be… I never had a totally clear picture of what I truly wanted. I guess I always wanted to work in fashion but had no idea which way I wanted to direct myself. I had a lucky start at Levi Strauss and gained a great solid background in fashion, merchandising, styling and eventually setting up all their concept stores across Australia. I also worked every Saturday in fashion retail on Chapel Street for almost ten years and learnt a lot from the day-to-day running of a store. In the background I always wanted my own store to highlight my wonderful collections – I realised at some point that my career at Levi’s (after 12 years) had reached the point which was as far as I wanted to, or could, take it without moving interstate and that was not something I wanted to pursue. I knew my passion for collecting was something that came naturally, as did decorating and styling. I only every studied secretarial skills when I left school and, back in the day, I went to a secretarial college to learn on a typewriter with carbon paper… seems funny now. I also learned the skill of shorthand which I can tell you I have never used. I have had a few courageous moments and the first one was leaving my cosy comfortable role styling and merchandising for Levi Strauss and deciding I would give my small idea of opening up a shop a go! Initially I was put off by neighbours in the street telling me I had picked the wrong end of the strip, that the shop was too small, that I was crazy and I wouldn’t last. 23 years on, I am so happy I did not listen to anyone else. To me, in my mind, the worst I could do was lose a year of my life giving it a go and at least never regret it, which of course I never once thought. I had no idea what I was doing but had a good background from my years in retail and merchandising. Of course, at the time it was a big leap, I had no idea what would come of the leap… would I be able to pay the rent, pay myself and so on? I started small and made sure I managed the incomings and outgoings. I noticed very quickly that after a few quiet months to get going, my customers kept coming back, which I knew was a good sign. I do recall, in the first year, a moment when I was in tears out the back of the shop, wondering what I had done and what was I doing. In the end, my determination always came back to my values of hard work and my deep passion for my store and what I wanted to sell to my customers. I basically sold all the things I loved and hoped that people would also appreciate and ‘get’ what I was doing and want what I collected….well, it worked!! Particularly when I opened the store, there were no other styled, curated vintage stores. The only other choices were old antique stores which were usually run by older men and were very heavy old fashioned antiques rather than a collection of edited pieces from the country right through to industrial wares. The other leap was venturing into the boutique accommodation world, something I knew nothing about. Eight years on and I now own four very bespoke and special accommodations in Melbourne and the countryside. I had never worked in that area but I wanted to create places that I personally would love to stay in. I always ask myself the same questions: what would I love? What would I want to see and feel if I went away for a weekend? How would I expect the service (i.e. customer service which I pride myself on)? How would I want to be treated etc. etc.? I learned from the ground up and have had to deal with 99% lovely guests, and 1% unkind or just unhappy guests that were never going to love or get your aesthetic! From those few, I have learnt to be better again at what I do. I have had tears of frustration, although I always manage to pick myself up and reverse the situation by making sure it’s handled in the most professional manner and by, of course, learning from the experience. In the early days, my mother, for taking me to markets and exploring ways to decorate with our finds. My mother always had such great interior style. I always remember my school friends thinking they had walked into a gallery, ‘oohing’ and ‘ahhhing’ and talking about the home to all their friends. We were very lucky to have very forward thinking parents and we moved into a St Kilda Road apartment in the heart of Melbourne from an early age, which to me was very inspiring in my early years. My dad who is not with us today and passed away many years ago, was very skilled artistically, his handwriting alone was something I always admired. I admire and love Iris Apfel for doing what she does best and having no one else tell her otherwise. Her dress sense and style is a huge influence. At her age having so much get up and go and attitude to boot, I love it. I am inspired by a positive attitude and confidence in people in general. I was happy and confident in myself to be able to give it go and just go for it! I knew that I wasn’t risking big amounts of money and that no one would get hurt along the way by giving my dreams a go! I also had my background of working in customer service with a big corporation for many years and face-to-face retail experience prior to launching my own store and taking the next step. The role I had gave me nowhere else to go! I was stagnant and needed to do something for myself. I took the leap. I had a good year off before I decided to take the leap. At the time I had no idea what I wanted to do. I wanted to keep my mind open and I knew something would lead me in the right direction. One thing led to another. I was driving through Albert Park where I spotted a tiny store that had a ‘For Lease’ sign and it got me thinking, thinking, thinking, as I had always wanted my own store! Could I? Should I? Would I? Why not? My husband at the time was very open and secure in his position, so that helped me take the big leap. It was a case of just saying GO FOR IT. Simple! That was all I needed to know because, of course, I didn’t expect to be paid a wage for some time, so it did make the decision process a little easier. I chose courage because it was truly all I wanted to do at that time. I knew I would do the best I could and give it all I could to make it work and I would never regret my decision to open that tiny little shop. A couple of years later, I moved to a shop double the size in the same area (in the same street) as I needed more space. This is where I am today 20 odd years later. I started with a lot of my own personal stock – collections I had at home that I was prepared to let go. Plus, at the time, I had the support of my partner, who was working full-time. It did not take long to cover all my own costs, bills, rent etc, but it was great to know I could lean on him during that time. Leapt into the world of accommodation as mentioned. Starting with The White House Daylesford, The White Room Fitzroy, then The Estate Trentham and most recently The Apartment St Kilda. No leaps that have not worked out as yet. In saying this, I always believe you learn from all of your mistakes or trials along the way. Perhaps when I was younger I was more fearful of how, what, why and what if? Now I treat it all as experience and won’t let it stop me from trying and doing what I believe is right. However, if I really think about it perhaps I am fearful of having too much on my plate. I am currently balancing a lot. I’m managing but I don’t want to tip over and take it so far that I lose control. I don’t want to grow too big and lose the personality that is my business. 10, easy, did not even have to think about it. Being proud of what you achieve! Learning so much along the way in small leaps and gaining more knowledge as you go. I’m proud of starting so small and now having such successful businesses that I built from the ground up. Knowing it was all built from the ground up is so important. It’s not just the good easy stuff, it’s the little hard goings-on behind the scenes that are so, so important. The only downside was the first year of not knowing how it will all end up. Thoughts of will I manage, will I be able to pay the rent, and so on. I got through it by adopting a positive attitude and having, at the time, a husband who supported my way of thinking. I always believed if it did not work, it was ok, I would have given it a go and learnt a lot along the way. I have already worked out another leap and am on this next journey, which I can’t reveal today – something new for the end of the year!! You just can’t stop me! This time it will be with my partner Mark. I always imagine that will be it for a while, but then another exciting opportunity falls on my lap. Most of the time I’m not looking for it, things just fall into place and it’s meant to be. You have heard it all before; believe in yourself and give it a go! There is nothing more simple but it has worked for me. Probably people in my own industry, people who do what they love and just keep rolling on to bigger and better things. All things that are real and simple! Leaps that these people are doing naturally because it’s what they love! Glen Proebstel for taking himself to New York and doing what he loves best! Kara Rosenlund for producing such amazing works and now her first book! Megan Morton for opening The School and doing what she does best worldwide now including books, classes and more. Personal friends who just do what their heart tells them to do and just grow and grow into successful business owners while being so much fun along the way – Stuart McKenzie and Simon Carver, owners of South of Johnston Cafe, and accommodation properties. They never cease to amaze me and are forever just so inspirational. Just listening to their stories and their passion for their business is such a great insight for me always. They are all so admirable and people I look up to along the way. Go, go, go! You can only ever say that you gave it a go and if it works you will never look back. If it doesn’t, at least you will never say you didn’t try. You also learn so much from making mistakes that it may help you take the next leap! Make sure it’s what you are truly passionate about. Hearing: Lots of building works going on in my latest project The Apartment St Kilda which has now launched! Eating: Addicted to venturing out for breakfast as much as possible. Drinking: Vodka cocktails or caprioscas. 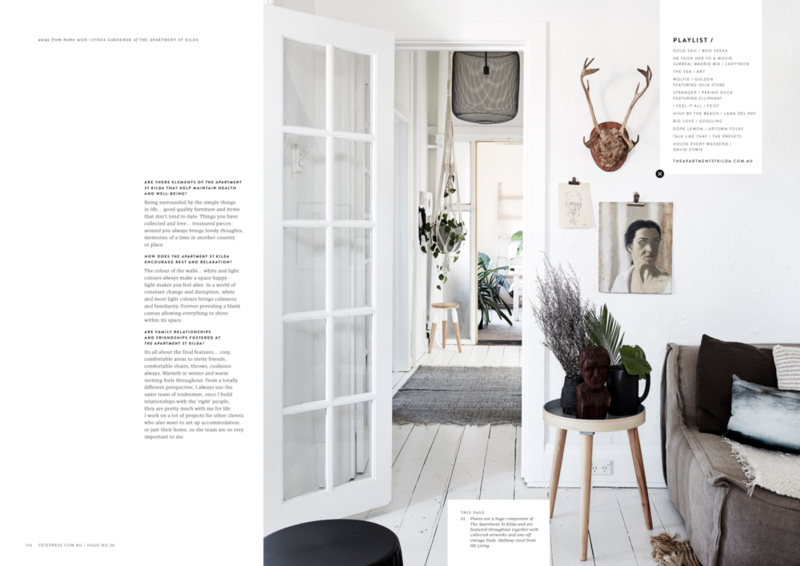 Reading: Never without an interior book or magazine in my hand. Loving: My new projects right now, together with my partner. We have a new one up our sleeve for later in the year! And always loving my dog, Jack (our cocker spaniel), he is just such a big part of this beautiful family, no matter what we do. Lynda’s story reminds me that every single one of us is unique and can creatively craft a working life by combining the things we love, in our own way throughout our whole life. We don’t have to be just one thing. We don’t have to fit one box. We don’t have to conform. We don’t have to be a slave to trends, traditions or timelines. 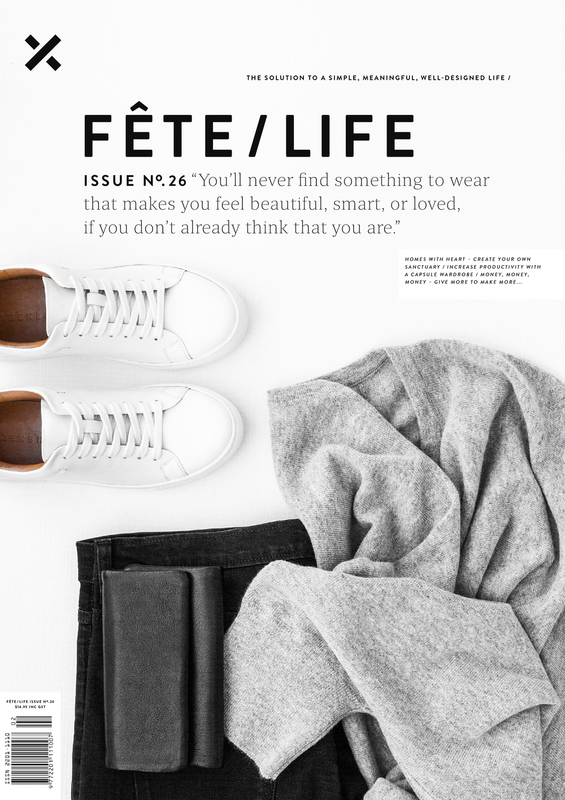 Style your own life, your own way.